The American Board of Internal Medicine (ABIM) has transformed over the past two years thanks to feedback from the physician community. These insights have yielded important changes to our programs, including the roll out of the new two-year assessment option called the Knowledge Check-In. Direct physician feedback has also been the driving force for changes to our website and Physician Portal, at abim.org, with major updates debuting in early 2018. To carry out this work, ABIM convened a group of volunteer physicians from our Community Insights Network to form the Portal Advisory Panel. This group met on a monthly basis to provide feedback and guidance on the enhancements being made to the Physician Portal. These meetings — combined with monthly user-testing with various physicians — have led to the creation of a new Physician Portal and public website that is more user-friendly and intuitive. We hope that these improvements help make maintaining your certification online easier than ever. Get a sneak peek of the new platforms below! No more rooting around lists of links to find what you’re looking for; all you need is now on the landing page of our new and improved Physician Portal. 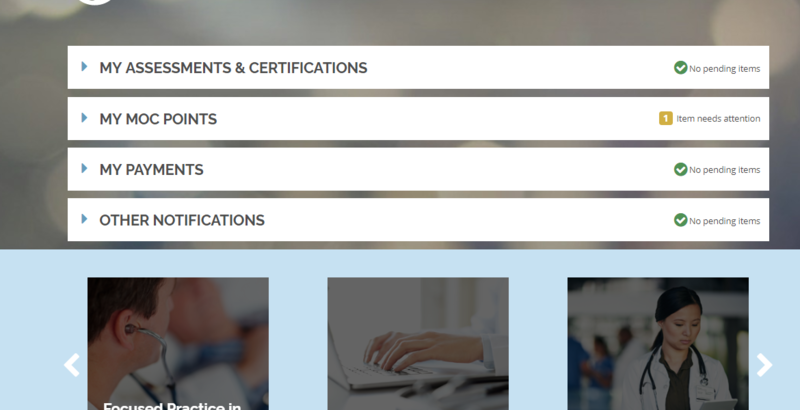 After signing in to abim.org, you will find clearly-labeled expandables with personalized notifications to help you determine what you need to do next to obtain or maintain your certification(s). No need to hunt down your ABIM ID either, because you’ll be able to sign in using your email address. So make sure that your contact information is updated to make the transition as seamlessly as possible come January. Not only does the public website have an updated look, but navigating the site from your mobile device will be much more manageable with the new responsive design. Find all the essential information you need to obtain and maintain your certification: FAQs, blueprints, and evidence supporting certification and MOC, including journal articles and infographics to share with your patients and colleagues. Weigh all your assessment options with new resources comparing the traditional 10-year MOC exam with the new 2-year Knowledge Check-In assessment. We recently released a survey to members of the ABIM Community Insights Network to get feedback on our current website, and we intend to release another survey a year after the new website launches. What you do is so incredibly important. It is our commitment to you to continue to pursue feedback about ABIM’s communications as we seek to consistently improve your experience with ABIM. Thank you for your commitment to life-long learning in service of your patients and for helping us co-create a more relevant and meaningful ABIM.